How does a nonprofit prove that it makes the most of every dollar donated? How does a charitable organization convince its supporters that it deserves more funding? How does an agency measure the social impact of its technology investment? For example, the Atlanta Mission, a large network of shelters for the homeless won board approval and raised 100% of the funding needed for a major overhaul to its donor management system…that is, once TechBridge calculated the project’s value at more than $100,000 in cost savings annually; that translates into a gob smacking return on investment (ROI) of 216% over 5 years. With these projected results, the support followed. And, with these savings and potential for improved fundraising results, the Atlanta Mission verifies its operations, its decisions and can do even more. Another early adopter, Rainbow Village, a nonprofit transitional housing program for families in Duluth, Georgia (and recipient of annual TechBridge technology grant) wanted to prove that its model for moving homeless families out of crisis was highly successful and repeatable –and that its investment in IT systems was paying off in many ways. Rainbow Village believed TechBridge’s ROI Calculator could create reports to its board and funders that would serve as remove the doubt that crept into conversations about client service, improvement, and growth. Could technology save the day? The ROI Calculator demonstrated how the technology investment provided key performance measures, improved fundraising performance, implemented its strategic plan and captured other measures that saved enormous amounts of time, effort and energy, so Rainbow Village case managers could spend more time interfacing with clients. The ROI helped win approval, giving this amazing nonprofit the additional funds needed to implement a customized Salesforce-based client management system. The new system is estimated to save Rainbow Village $18,900 per year through reduced manual administration time required to generate the client metrics used in its decision making. In helping other nonprofits, we discovered a missing tool in our own technology toolbox. TechBridge, founded as a nonprofit to help other nonprofits tap into smart technologies –has helped hundreds of nonprofit organizations do more services –with technology. However, we missed something important. TechBridge has implemented inventory technology tools to help food pantries manage food donations and shelters to manage available beds in shelters. We help keep runaways linked to other teens and safe house case workers. We link nonprofit partners together to share data. But, we didn’t create a tool to measure how technology matters to these nonprofits and made a difference. Technology is invisible; how do we prove its worth? Executive directors needed a way to back up their arguments that better technology was allowing them to make a bigger impact. To help, TechBridge needed to standardize how its nonprofit clients capture and communicate outcomes of our technology investments. Basically, the “ROI Calculator” takes the input (dollars invested) in a technology project and calculates the return on investment (ROI) in savings (dollars saved, hours saved), and the number of additional clients served. Soon, this tool will be integrated into all TechBridge technology projects. A picture is worth a thousand words. TechBridge is thrilled to share our nonprofit clients’ success stories, and our own journey of measuring the impact of technology investments. This innovation is continuing to grow and evolve. Thanks to a collaborative project with a Georgia Tech student group, Epic Intentions, TechBridge has developed an ability to visualize outcomes from the ROI Calculator using Tableau dashboards, both at the individual nonprofit level, and aggregated geographically by zip code in our three major communities of Georgia, Alabama, and Tennessee. 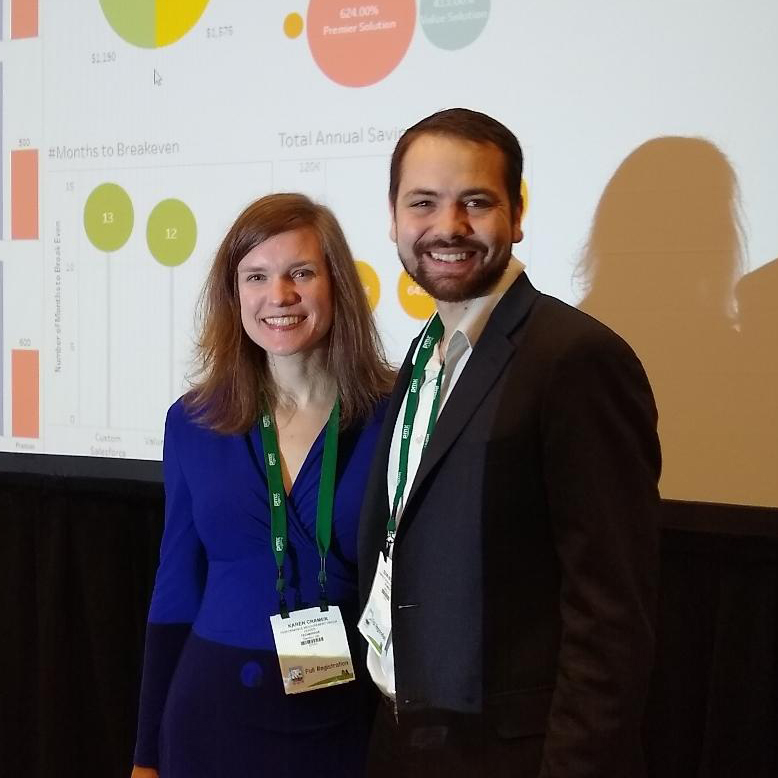 In March, TechBridge co-presented with Los Angeles-based Mercy for Animals and Chicago-based National Immigrant Justice Center on the ROI Calculator at NTEN’s 2019 Nonprofit Technology Conference (NTC) event. Join us by helping your nonprofit become part of the technology innovation ecosystem. TechBridge is working to translate the direct outcomes of technology investments from dollars saved, hours saved, and clients served into the wider lens of estimated economic impact of those outcomes to society. Consider the increase in the number of homeless families the Atlanta Mission or Rainbow Village (above) serve, tying that metric into an evidence-based academic study that can translate it into economic impact metrics, such as community savings through the reduction of uninsured emergency medical cost. The process is complex, but we are beginning to achieve real results by leveraging existing tools such as the Low Income Investment Fund’s (LII) Social Impact Calculator, as well as investing R&D funding into our own technology which we hope to bring to market later this year. Big yawn, right? More calculators for nonprofits! But, what questions would a Social Impact Calculator answer for nonprofits, their executive directors, and their board members? Questions like…Are shelters having a notable impact to change chronic homelessness in Atlanta? Are these homeless the same people we housed one year ago? Or, not? Knowing this is meaningful in an age of data-driven decision making. What’s happening in food security? Are foodbank clients getting on their feet again but it’s only short-term success and they are returning months later? Or, are they finding paths to stability and the nonprofit is serving no people in crisis situations? We know nonprofits do good work every day, let’s use a tool to explain what differences they make.